First off, check out the Winter Wheat Hat in Flicker, designed by Kristen Ashbaugh-Helmreich. The hat’s stitch pattern is a perfect match for Flicker’s bouncy elasticity, and the slightly slouchy fit is very flattering. I’d love one of these in every color. Next, take a look at the Miyoko short-sleeved top from Cheri Christian. Cheri mentioned to me that she’s a big fan of Seduce, and it shows. She’s clearly an expert when it comes to understanding the drape and texture of the yarn, and created a beautifully ruched panel that runs down the front before curving to one side. If you’ve been looking for colorful project ideas, you should definitely consider Cara Key’s Zonkey Knitted Toy, worked in Weekend. This adorable toy (inspired by the real-life zebra/donkey mix) features stripey limbs and a cute little donkey tail. I also love the colors Cara chose – bright and perfect for kids! Last but not least, we have Heather Ramsay’s irresistible February Toddler Tunic in Comfort. This sweet little top features lace and garter stitch details inspired by Elizabeth Zimmermann’s February Baby Sweater, but is reinterpreted in tunic form with features perfect for an energetic toddler. Thanks so much to all the designers for using our yarns – I can’t wait to see what they come up with next! 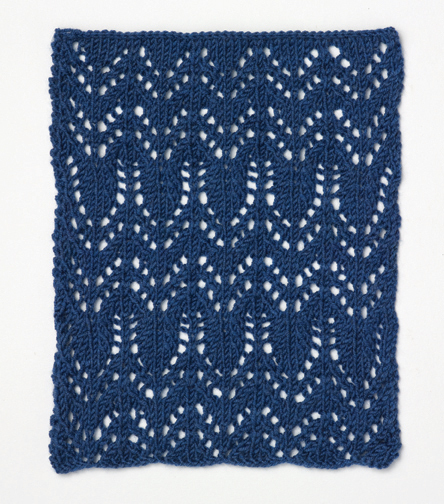 5 Free Lace Stitch Patterns from Lion Brand Free Knitting Patterns from Berroco!